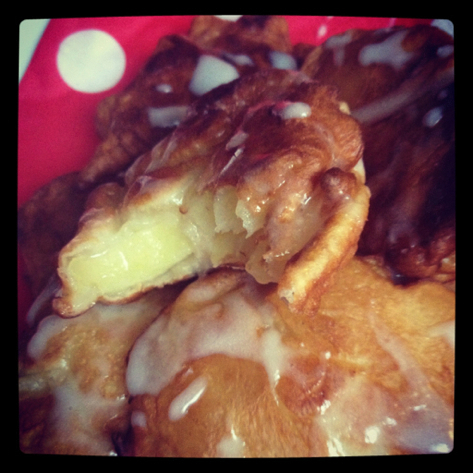 Following last weeks brunch mishap, these apple fritters were happening. Not in the cool, hip sense, but as in "They will be made. They will be consumed. 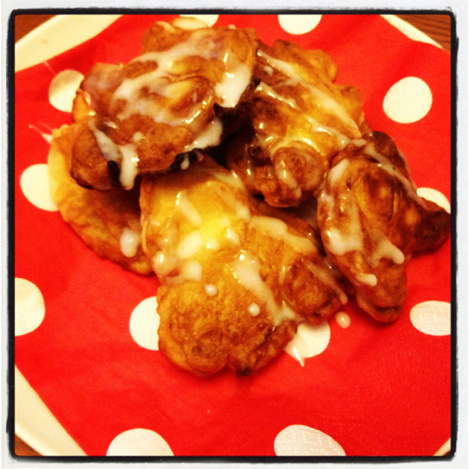 They will be enjoyed"
Unlike a lot of apple fritter recipes, these aren't deep fried. I know a lot of people don't like vast quantities of hot oil and I certainly didn't want to messing around with that in the morning but I found that just less than a centimetre of hot oil in a frying pan works just as well without that stomach turning fear of a huge pan of the stuff! The cardamom adds a delicious, fragrant citrussy note to these making them even more delicious. Who would have thought that was possible! 2, In a bowl, sift in the flour, sugar, cardamom and salt and mix together with a whisk to keep it light and airy. 3, Beat in the egg and milk and you should have a thick sticky dough. 4, Add in the apple and stir until all the apple pieces are covered evenly. 5, Test the oil by gently dropping in one piece of coated apple. It should bubble and float to the top when it is hot enough. 7, When they are golden brown and cooked through, remove from the oil and drain on kitchen paper. Enjoy hot sprinkled with icing sugar. Wow that looks delicious. I really can't imagine myself making these in the mornings but, actually, if I weigh out the dry ingredients the night before and do this on a weekend morning, it would be wonderful! I haven't eaten a fritter in far too long. These sound ideal. 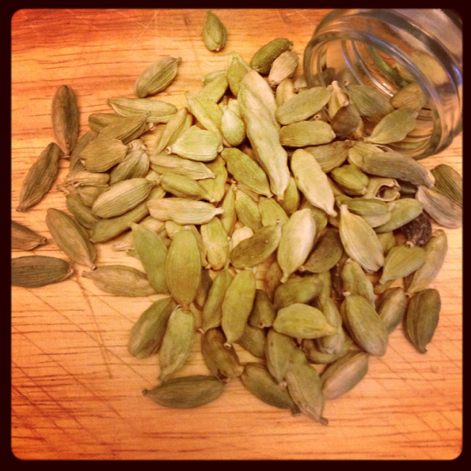 Love the idea of using cardamom with the apple.